You pull into your local cruise night or show and everyone has their trunk open, yours not so much as it looks like, well hell! Change that with a few simple products and parts from Fbodywarehouse. We offer spare tires, jacks, trunk mats, and more to bring the trunk compartment of your Camaro or Firebird back up to standard! This is a Officially licensed GM Restoration Parts Reproduction standard fuel filler cap for 1967 1968 Camaro standard models from OER. This gas cap was standard on all 1967-68 models and comes finished in factory primary so it is ready to paint to the desired color. This is a new replacement 67-68 Camaro Supoer Sport gas cap. This is an officialy licensed GM reproduction part. This is a pair of new replacement fuel tank straps for use on 1967 - 1969 Camaro and Trans Am. Produced from pre-formed steel and zinc coated for an original appearance. This is a pair of new replacement mounting braces used to secure the fuel tank EIP coated to prevent rusting. This is a new replacement fuel door for use on 1969 Camaro (All Models) Includes hinge assembly. Stamped to proper GM specs does not include mounting hardware. 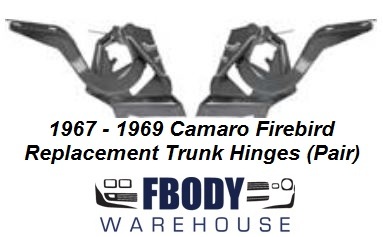 1967 - 1968 Camaro Rear Body Panel NEW! 1969 Camaro Rear Body Panel NEW! 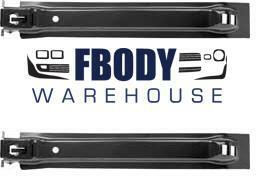 This is a rear upper body panel for 67-69 camaro and firebird. This is a rear inner valance panel for 1969 Camaro. 67 - 69 Camaro Deck Lid, with catch and pre drilled spoiler mounting holes. Don't worry about drilling holes in your new deck lid anymore. Made to original specs for a great fit. Order yours today!! New correct jack base with exact detailing. Prefect fit for all 68 - 74 models. Does not have any date code stamping. For display only. Show quality reproduction with original stamped text and numerals for1968 Camaro. Officially Licensed GM Restoration Part This is a trunk mounted trunk adaptor for changing your tire. For use on 1967 - 1981 Camaro Firebird Trans Am. 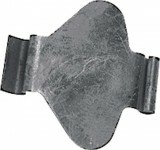 New rear inner rocker panel drain plug rubber flap covers for your classic. Super easy to install, just push and snap into place. Sold by the pair, does one car. 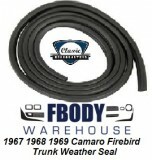 This is a new replacement trunk weather seal for use on 1967 - 1969 Camaro and Firebird Models. This is a new replacement bump stop kit for use on 1967 1968 1969 Camaro and Firebird. This is a 16 pc kit. This is a pair of new replacement trunk hinges for use on your 1967 1968 1969 Camaro / Firebird / Trans Am. Sold as a pair left and right. Reproduction of the original package shelf panel brackets, also known as braces, or trunk lid hinge extensions for 1967-69 coupe models. This bracket mounts underneath the rear package shelf panel and attaches to the rear wheelhouse and the back seat brace. Replace your rusted originals with this quality reproduction. For coupe models only. This is a new replacement rubber bump stop kit for use on 1967 - 1969 Firebird. This is a 14 pc kit. When installing new replacement weather stripping, replacing the bump stops is also needed. These are simple to install and provide the factory gapping which will prevent premature aging of new weather seals. This is a new trunk mounted spare tire inflation bottle decal for Camaro inner trunk lid. This is a new trunk mounted space saver spare tire decal for Camaro inner trunk lid. For use on 1967 1968 Camaro models with factory space saver spare tire. This is a new jacking instruction decal for Camaro inner trunk lid. This new replacement peel and stick decal is dead on and includes the GM part # 39909124 printed on it.